This detailed map is double-sided to give maximum coverage, and so covers most of the town. The main map covers the western part of the town, with coverage stretching from Agnew Street and Beach Street westward towards Ansdel, incl St Paul's church. Features include Marine Lake, Ansdell goods station, Fairhaven Hotel, St Cuthbert's church, Lowther Gardens. 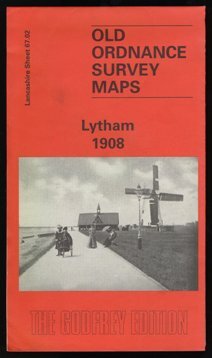 On the reverse we include a large part of adjacent sheet 67.03 covering Lytham town centre. Features here include railway with station and goods station, pier, Market Square, tramways and tram shed, windmill, Assembly Rooms, cottage hospital, Albert Hall. A shipbuilding yard on the Liggard Brook is in the NE corner. The map links up with sheets 59.13 St Annes to the west and 59.14 Lytham Hall to the north. The Alan Godfrey Series of Old Ordnance Survey Maps.